Otonashi. My guess is Noda gets killed first. Set between episodes two and three, during Golden Week, Yuri arranges for the SSS to go on a deadly picnic, which involves most of the members trying to kill each other with various traps and gadgets. Sensing an opportunity, Girls Dead Monster members Miyuki and Shiori conspire to kill Iwasawa and seize control of the band from her. 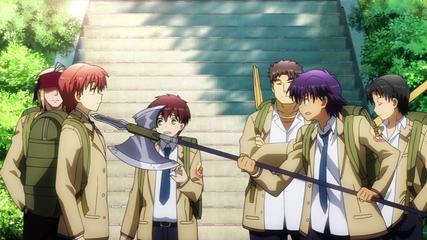 As the boys largely fall victim to various traps, leaving just Otonashi alive, Miyuki and Shiori attempt to lead Iwasawa into various pitfalls, but she survives each one while remaining completely oblivious. They attempt to use their last trap, a dreadful concoction, with the help of Shiina, but it instead lands on Hisako, who transforms into a bloodthirsty monster that not even Angel can stop. Sometime later, Miyuki and Shiori explain the events of the picnic to Yui and how they inspired the band to take on their current name. Hmm ... sounds even goofier than the first OVA. My estimate of Yuri has gone down a bit. She seems to be something of a sadistic little b---h in having your friends kill each other off. While yes, in the Angel Beats world death has been reduced to the status of a punch in the nose, one would think at least a few in the Battlefront would be plotting to kill off Yuri or at least lock her up in a "contemplation" room where she couldn't harm anyone. This is the kind of "leader" I would NOT follow. I'll just rate this as a curiosity and not consider it part of Angel Beats. Pretty much the way I'm getting to view the Evangelion "rebuild" films.